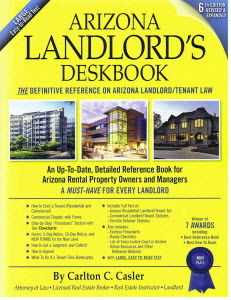 Arizona Landlord Tenant Blog: Lease/Rental Agreement - What is the difference? Lease/Rental Agreement - What is the difference? There is no real difference. Some practitioners refer to a "lease" when referring to a rental agreement for a specified period (i.e., six months, one year, etc.) and refer to a "rental agreement" when tenancy is month-to-month and/or when a written agreement does not exist (i.e., an oral "rental agreement"). Both terms (i.e., a lease or rental agreement) refer to an agreement between a landlord and a tenant to rent a piece of real property. An oral one-year "lease" is just as enforceable as a written month-to-month "rental agreement," the distinctions may merely be the length of the term that the parties are bound by the agreement. Naturally, the problem with any oral agreement, including an oral "lease" or "rental agreement," is when the parties disagree as to the terms of the oral agreement, which is why it is always best to have a written agreement. And that is true whether you call it a "lease" or a "rental agreement."